This cookie cake was simple and a huge hit will all the guest. Image courtesy of Debbie Morrow. This is the last installation in the Minecraft Madness series. We’ve gone over an easy game to make, our gaming trailer rental, schedule and glitches, food presentation, DIY favors, and more. You’ll find many different printables on each of the posts within this series. 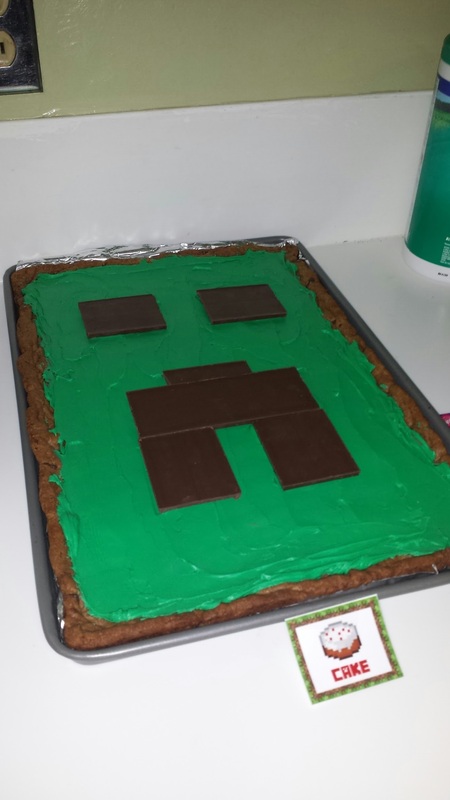 For part 5, we’ll go over the Minecraft cake, decorating ideas and other printable/idea links that were helpful. Made from a cookie cake recipe, it was topped with green frosting and chocolate bars broke into bricks for the eyes, nose/mouth. Since so much effort was put into decorations, appetizers, and snacks, it was the perfect ending to an amazing spread of food. A visually appealing way to hand out TNT. Thanks to Rainy Hot Coupons at Buzzfeed. Don’t forget to deck the bathroom out with Minecraft items as well! Image courtesy of Debbie Morrow. All rights reserved. Instead of giving grab bags, have your guests make their own! Image and tutorial from Catch My Party on Buzzfeed. Not overdosed with Minecraft info yet? Check out the links below for more MC printables,ideas, and even coding classes for Minecraft too!